The Dutch, on the other hand, are averse to romance and loosened from their Christian roots and now worship liberal ideas. These were just some of the observations made at a packed Poesjink venue in Amsterdam for the launch of a new book In the mirror - Dutch people about Russia and Russians about the Netherlands. The book is edited by Peter d’Hamecourt, a journalist and former TV correspondent who worked in Russia from 1989 to 2008. Peter d’Hamecourt and Jeroen Ketting. The Amsterdam presentation will be repeated in Moscow on 5 June at The Night Watch cafe. The Ministry of Foreign Affairs engaged Elenea Koetnaja to translate the stories from Dutch into Russian. Aai Prins translated the Russian stories. Given the trading relations that ING has with Russia, ING acted as a sponsor of the book and hosted the event, which took place to celebrate the Netherlands-Russia year (2013). Employees from ING’s Sponsoring team and Commercial Banking were present at the 29 May launch. You can read more about the Netherlands-Russia year in the May issue of ing.world, which includes a report from the ING Economics Department: Russia, unlocking the potential. Read the special e-magazine The Netherlands-Russia Year 2013 (PDF). 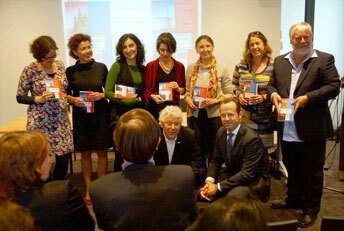 Watch a video report of the book presentation – sorry, Dutch only.